It has been awhile since I have reviewed a beauty item; however, I'm still a huge fan of all things beauty. (Check out some of my favorites here.) Recently, I was perusing the aisles of Target when I came upon a full display of new e.l.f products. The Studio Makeup Mist & Set spray immediately caught my attention. I had never seen it before and I'm always looking for a cheaper alternative to some of my pricey beauty staples. I picked it up and after seeing Thrift Glam's review of the spray, I had to try it! Before we get into the review, let's take time to learn a little bit more about this product. Keep your makeup staying in place all day with a radiance boosting invisible hold with our new Makeup Mist & Set. The invigorating mist moisturizes and soothes the skin with key ingredients Aloe, Green Tea, Cucumber and Vitamins A, C & E. The lightweight, comfortable and alcohol free formula improves makeup wearability and prevents color from running or fading. Let me be real with ya'll for a second... This product blew me away! I have combination skin where my forehead, nose and chin are constantly oily. This product did a fantastic job at keeping my skin matte and fresh looking. However, I will say that after about four hours of wear, I did have to blot my skin and I chose to respray the product. Typically, I would not respray my skin only because of lack of time; however, I really wanted to see how well this product would work. After using my favorite oil sheets, Mary Kay Beauty Blotters, I resprayed the product and my skin stayed perfectly matte and fresh for an additional six hours. So, in total, I wore this product for almost 10 hours and it was phenomenal. All of this awesomeness for $3! Are you a fan of e.l.f? Have you used this product? P.S. Don't forget to enter my holiday giveaway for a chance to win a pair of shoes from Heavenly Soles? Enter here. Big fan of elf and this product. I bought it because it was $3! It's great in the summertime. 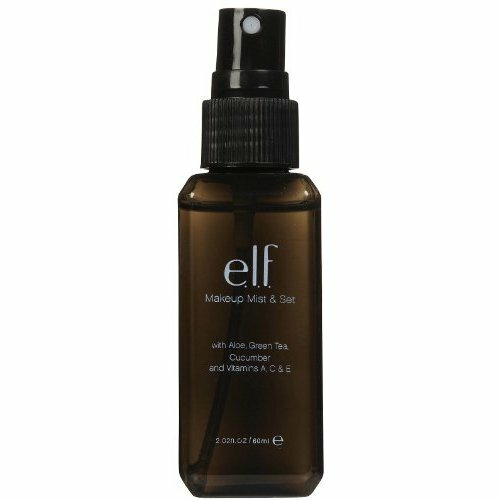 You get a nice cooling spray and it freshens up the makeup. Love it. I have this product in my makeup kit! I am a fan because I think it had the same quality as the more expensive Urban Decay spray! And for $3...who could pass it up??? i always check out e.l.f. makeup at target & i've never actually bought any of it! i'll definitely have to try this... my makeup NEVER stays in place all day! it's such a pain!